John continues... "Now take a look at Linn's black target. 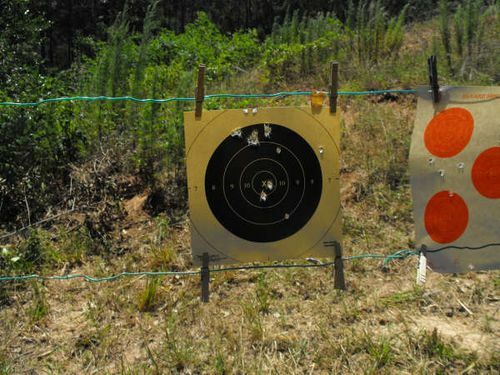 You will see two shots clipped the top of the target, she then walked the shots down to the center x ring. There is one spot where two shots went thru together, another where three form a triangle, etc. Not bad for the first time she had ever fired her dad's gun. A .45 Long Colt is a big heavy cartridge, kicks a lot and takes some getting used to. Kinda proud of my little farm girl..."